Carousels are a popular website feature because they allow one to fit extra information within the same footprint and provide visual interest on a page. But as you most likely know, there is wide disagreement about whether they should ever be used. Reasons include: they can be annoying, no one spends long enough on a page to ever see beyond the first item, people rarely click on them (even if they read the information) and they add bloat to pages (Michael Schofield has a very compelling set of slides on this topic). But by far the most compelling argument against them is that they are difficult if not impossible to make accessible, and accessibility issues exist for all types of users. In reality, however, it’s not always possible to avoid carousels or other features that may be less than ideal. We all work within frameworks, both technical and political, and we need to figure out how to create the best case scenario within those frameworks. If you work in a university or college library, you may be constrained by a particular CMS you need to use, a particular set of brand requirements, and historical design choices that may be slower to go away in academia than elsewhere. This post is a description of how I made some small improvements to my library website’s carousel to increase accessibility, but I hope it can serve as a larger discussion of how we can always make small improvements within whatever frameworks we work. What Makes an Accessible Carousel? We’ve covered accessibility extensively on ACRL TechConnect before. Cynthia Ng wrote a three part series in 2013 on making your website accessible, and Lauren Magnuson wrote about accessibility testing LibGuides in 2015. I am not an expect by any means on web accessibility, and I encourage you to do additional research about the basics of accessibility. For this specific project I needed to understand what it is specifically about carousels that makes them particular inaccessible, and how to ameliorate that. When I was researching this specific project, I found the following resources the most helpful. The basic issues with carousels are that they move at their own pace but in a way that may be difficult to predict, and are an inherently visual medium. For people with visual impairments the slideshow images are irrelevant unless they provide useful information, and their presence on the page causes difficulty for screen reading software. For people with motor or cognitive impairments (which covers nearly everyone at some point in their lives) a constantly shifting image may be distracting and even if the content is interesting it may not be possible to click on the image at the rate it is set to move. You can increase accessibility of carousels by making it obvious and easy for users to stop the slideshow and view images at their own pace, make the role of the slideshow and the controls on the page obvious to screen reading software, to make it possible to control the slideshow without a mouse, and to make it still work without stylesheets. Alternative methods of accessing the content have to be available and useful. I chose to work on the slideshow as part of a retheming of the library website to bring it up to current university branding standards and to make it responsive. The current slideshow lacked obvious controls or any instructions for screen readers, and was not possible to control without a mouse. My general plan in approaching this was to ensure that there were obvious controls to control the slideshow (and that it would pause quickly without a lot of work), have ARIA roles for screen readers, and be keyboard controllable. I had to work with the additional constraints of making this something that would work in Drupal, be responsive, and that would allow the marketing committee to post their own images without my intervention but would still require alt tags and other crucial items for accessibility. Because the library’s website uses Drupal, it made sense to look for a solution that was designed to work with Drupal. Many options exist, and everyone has a favorite or a more appropriate choice for a particular situation, so if you are looking for a good Drupal solution you’ll want to do your own research. I ended up choosing a Drupal module called Views Slideshow after looking at several options. It seemed to be customizable enough that I was pretty sure I could make it accessible even though it lacked some of the features out of the box. The important thing to me is that it would make it possible to give the keys to the slideshow operation to someone else. The way our slideshow traditionally worked required writing HTML into the middle of a hardcoded homepage and uploading the image to the server in a separate process. This meant that my department was a roadblock to updating the images, and required careful coordination before vacations or times away to ensure we could get the images changed. We all agreed that if the slideshow was going to stay, this process had to improve. Why not just remove the slideshow entirely? That’s one option we definitely considered, but one important caveat I set early in the redesign process was to leave the site content and features alone and just update the look and feel of the site. Thus I wanted to leave every current piece of information that was an important part of the homepage as is, though slightly reorganized. I also didn’t want to change the size of the homepage slideshow images, since the PR committee already had a large stock of images they were using and I didn’t want them to have to redesign everything. In general, we are moving to a much more flexible and iterative process for changing website features and content, so nothing is ruled out for the future. I won’t go into a lot of detail about the technical fixes I made, since this won’t be widely applicable. Views Slideshow uses a very standard Drupal module called Views to create a list of content. While it is a very popular module, I found it challenging to install correctly without a lot of help (I mainly used this site), since the settings are hard to figure out. In setting up the module, you are able to control things like whether alt text is required, the most basic type of accessibility feature, which allows users who cannot see images to understand their content through screen readers or other assistive technologies. Beyond that, you can set some things up in the templates for the modules. First I created a Drupal content type is called Featured Slideshow. It includes fields for title of the slide, image, and the link it should go to. The image has an alt and title field, which can be set automatically using tokens (text templates), or manually by the person entering data. The module uses jQuery Cycle to control which image is available. I then customized the templates (several PHP files) to include ARIA roles and to edit the controls to make them plain English rather than icons (I can think of downsides to this approach for sure, but at least it makes the point of them clear for many people). ARIA role. This is frequently updated but non-essential page content. Its default ARIA live state is “off”, meaning unless the user is focused on it changes in state won’t be announced. You can change this to “polite” as well, which means a change in state will be announced at the next convenient opportunity. You would never want to use “assertive”, since that would interrupt the user for no reason. Features I’m still working on are detailed in The Unbearable Inaccessibility of Slideshows, specifically keyboard focus order and improved performance with stylesheets unavailable. However with a few small changes I’ve improved accessibility of a feature on the site–and this technique can be applied to any feature on any site. Making Small Improvements to Improve Accessibility. Review what the basic requirements are for making the feature work with your platform and situation. This means both technically and politically. Research the approaches others have taken. You probably won’t be able to use someone else’s technique unless they are in a very similar situation, but you can at least use lessons learned. Create a step by step plan to ensure you’re not missing anything, as well as a list of questions to answer as you are working through the development process. Test the feature. You can use achecker or WAVE, which has a browser plugin to help you test sites in a local development environment. Review errors and fix these. If you can’t fix everything, list the problems and plan for future development, or see if you can pick a new solution. This may seem overwhelming, but taking it slow and only working on one feature at a time can be a good way to manage the process. And even better, you’ll improve your practices so that the next time you start a project you can do it correctly from the beginning. Keeping any large technical project user-centered is challenging at best. Adding in something like an extremely tight timeline makes it too easy to dispense with this completely. Say, for instance, six months to migrate to a new integrated library system that combines your old ILS plus your link resolver and many other tools and a new discovery layer. I would argue, however, that it’s on a tight timeline like that that a major focus on user experience research can become a key component of your success. I am referring in this piece specifically to user experience on the web, but of course there are other aspects of user experience that go into such a project. While none of my observations about usability testing and user experience are new, I have realized from talking to others that they need help advocating for the importance of user research. As we turn to our hopes and goals for 2016, let’s all make a resolution to figure out a way to make better user experience research happen, even if it seems impossible. When I worked on implementing a discovery layer at my job earlier this year, I had a team of 18 people from three campuses with varying levels of interest and experience in user testing. It was really important to us that we had an end product that would work for everyone at all levels, whether novice or experienced researcher, as well as for the library staff who would need to use the system on a daily basis. With so many people and such a tight timeline building user testing into the schedule in the first place helped us to frame our decisions as a hypothesis to confirm or nullify in the next round of testing. We tried to involve as many people as possible in the testing, though we had a core group who had experience with running the tests administer them. Doing a test as early as possible is good to convince others of the need for testing. People who had never seen a usability test done before found them convincing immediately and were much more on board for future tests. Reference and instruction librarians are users too. We sometimes get so focused on reminding librarians that they are not the users that we don’t make things work for them–and they do need to use the catalog too. Librarians who work with students in the classroom and in research consultations on a daily basis have a great deal of insight into seemingly minor issues that may lead to major frustrations. Here’s an example. The desktop view of our discovery layer search box was about 320 pixels long which works fine–if you are typing in just one word. Yet we were “selling” the discovery layer as something that handled known-item searching well, which meant that much of a pasted in citation wasn’t visible. The reference librarians who were doing this exact work knew this would be an issue. We expanded the search box so more words are visible and so it works better for known-item searching. The same goes for course reserves, interlibrary loan, or other staff who work with a discovery layer frequently often with an added pressure of tight deadlines. If you can shave seconds off for them that adds up a huge amount over the course of the year, and will additionally potentially solve issues for other users. One example is that the print view of a book record had very small text–the print stylesheet was set to print at 85% font size, which meant it was challenging to read. The reserves staff relied on this print view to complete their daily work with the student worker. For one student the small print size created an accessibility issue which led to inefficient manual workarounds. We were able to increase the print stylesheet to greater than 100% font size which made the printed page easily readable, and therefore fix the accessibility issue for this specific use case. I suspect there are many other people whom this benefits as well. I firmly believe that everyone who is interested in user experience on the web should get some hands on experience with it. That said, not everyone needs to do the hands on work, and with a large project it is important that people focus on their core reason for being on the team. Dividing the group into overlapping teams who worked on data testing, interface testing, and user education and outreach helped us to see the big picture but not overwhelm everyone (a little Overwhelm is going to happen no matter what). These groups worked separately much of the time for deep dives into specific issues, but helped inform each other across the board. For instance, the data group might figure out a potential issue, for which the interface group would determine a test scenario. If testing indicated a change, the user education group could be aware of implications for outreach. Getting a new tool out with only a few months turnaround time is certainly challenging, but it forces you to forget about perfection and get features done. We got our hands on the discovery layer on Friday, and were doing tests the following Tuesday, with additional tests scheduled for two weeks after the first look. This meant that our first tests were on something very rough, but gave us a big list of items to fix in the next two weeks before the next test (or put on hold if lower priority). We ended up taking off two months from live usability in the middle of the process to focus on development and other types of testing (such as with trusted beta testers). But that early set of tests was crucial in setting the agenda and showing the importance of testing. We ultimately did 5 rounds of testing, 4 of which happened before the discovery layer went live, and 1 a few months after. The vendor or the community of developers is presumably not going to stop working on the product, and neither should you. For this reason, it is helpful to make it clear who is doing the work and ensure that it is written into committee charges, job descriptions, or other appropriate documentation. Maintain a list of long-term goals, and in those short timescales figure out just one or two changes you could make. The academic year affords many peaks and lulls, and those lulls can be great times to make minor changes. Regular usability testing ensures that these changes are positive, as well as uncovering new needs as tools and needs change. Iteration is the way to ensure that your long timescale stays manageable. Work never really stops, but that’s ok. You need a job, right? Back to that idea of a short timeline–borrow from the Agile method to think in timescales of 2 weeks-1 month. Have the end goal in mind, but know that getting there will happen in tiny pieces. This does require some faith that all the crucial pieces will happen, but as long as someone is keeping an eye on those (in our case, the vendor helped a lot with this), the pressure is off on being “finished”. If a test shows that something is broken that really needs to work, that can become high priority, and other desired features can move to a future cycle. Iteration helps you stay on track and get small pieces done regularly. I hope I’ve made the case for why you need to have a user focus in any project, particularly a large and complex one. Whether you’re a reference librarian, project manager, web developer or cataloger, you have a responsibility to ensure the end result is usable, useful, and something people actually want to use. And no matter how tight your timeline, stick to making sure the process is user centered, and you’ll be amazed at how many impossible things you accomplished. Understanding and responding to user needs has always been at the heart of librarianship, although in recent years this has taken a more intentional approach through the development of library user experience positions and departments. Such positions are a mere fantasy though for many smaller libraries, where librarian teams of three or four run the entire show. For the twenty-three member libraries of the Private Academic Library Network of Indiana (PALNI) consortium this is regularly the case, with each school on staff having an average of four librarians. However, by leveraging existing collaborative relationships, utilizing recent changes in library systems and consortium staffing, and (of course) picking up a few new cardigans, PALNI has begun studying library user experience at scale with a collaborative usability testing model. With four library testing locations spread over 200 miles in Indiana, multiple facilitators were used to conduct testing for the consortial discovery product, OCLC’s WorldCat Discovery. Using WebEx to screen record and project the testing into a library staff observation room, 30 participants completed three general tasks with multiple parts helping us to assess user needs and participant behavior. There were clear advantages of collaborative testing over the traditional, siloed approach which were most obviously shown in the amount and type of data we received. The most important opportunity was the ability to test different setups of the same product. This type of comparative data led to conclusive setup recommendations, and showed problems unique to the institutions versus general user problems. The chance to test multiple schools also provided a lot more data, which reduced the likelihood of testing only outliers. The second major advantage of collaborative testing was the ability to work as a team. From a physical standpoint, working as a team allowed us to spread the testing out, keeping it fresh in our minds and giving enough time in-between to fix scripts and materials. This also allowed us to test before and after technical upgrades. From a relational perspective, the shouldering of the work and continual support reduced burn out during the testing. Upon analyzing the data, different people brought different skill sets. Our particular team consisted of a graphic/interface designer, a sympathetic ear, and a master editor, all of whom played important roles when it came to analyzing and writing the report. Simply put, it was an enjoyable experience which resulted in valuable, comparative data – one that could not have happened if the libraries had taken a siloed approach. When we were designing our test, we met with Arnold Arcolio, a User Researcher in OCLC’s User Experience and Information Architecture Group. He gave us many great pieces of advice. Some of them we found to work well in our testing, while others we rejected. The most valuable piece of advice he gave us was to start with the end in mind. Make sure you have clear objectives for what data you are trying to obtain. If you leave your objectives open ended, you will spend the rest of your life reviewing the data and learning interesting things about your users every time. Test at least two users of the same type. This helps avoid outliers. For us, that meant testing at least two first year students and two seniors. Test users on their own devices. We found this to be impractical for our purposes, as all devices used for testing had to have web conferencing software which allowed us to record users’ screen. Have the participants read the tasks out loud. A technique that we used and recommend as well. Use low-tech solutions for our testing, rather than expensive software and eye tracking software. This was a huge relief to PALNI’s executive director who manages our budget. Test participants where they would normally do their research, in dorm rooms, faculty offices, etc. We did not take this recommendation due to time and privacy concerns. He was very concerned about our use of multiple facilitators. We standardized our testing as much as possible. First, we choose uniforms for our facilitators. Being librarians, the obvious choice was cardigans. 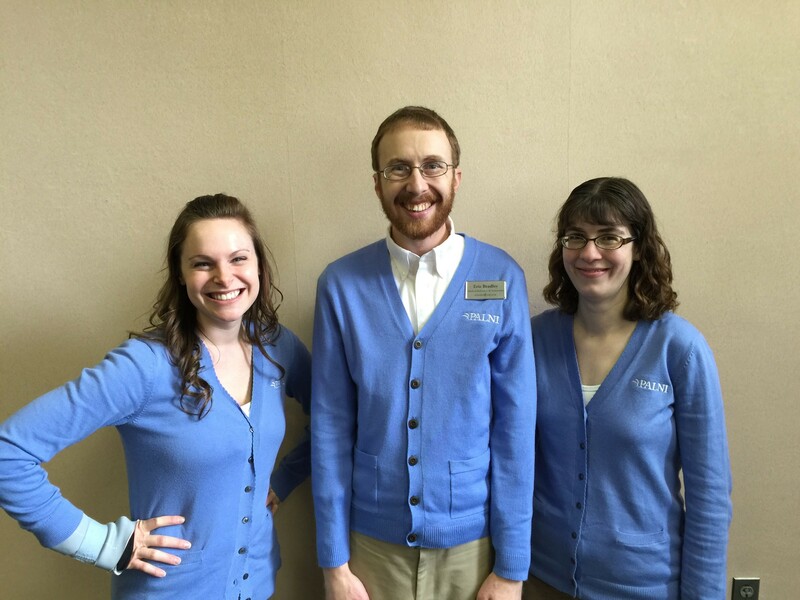 We ordered matching, logoed cardigans from Lands’ End and wore those to conduct our testing. This allowed us to look as similar as possible and avoid skewing participants’ impressions. We chose cardigans in blue because color theory suggests that blue persuades the participants to trust the facilitator while feeling calm and confident. We also worked together to create a very detailed script that was used by each facilitator for each test. Our next round of usability testing will incorporate many of the same recommendations provided by our usability expert, discussed above, with a few additions and changes. This Fall, we will be including a mobile device portion using a camera mount (Mr. Tappy see http://www.mrtappy.com/) to screen record, testing different tasks, and working with different libraries. Our libraries’ staff also recommended making the report more action-oriented with best setup practices and highlighting instructional needs. We are also developing a list of common solutions for participant problems, such as when to redirect or correct misspellings. Finally, as much as we love the cardigans, we will be wearing matching logoed polos underneath for those test rooms that mirror the climate of the Sahara Desert. We have enjoyed our usability experiences immensely–it is a great chance to visit with both library staff, faculty, and students from other institutions in our consortium. Working collaboratively proved to be a success in our consortia where smaller libraries, short staff, and minimal resources made it otherwise impossible to conduct large scale usability testing. Plus, we welcome having another cardigan in our wardrobe. Eric Bradley is Head of Instruction and Reference at Goshen College and an Information Fluency Coordinator for PALNI. He has been at Goshen since 2013. He does not moonlight as a Mixed Martial Arts fighter or Los Angeles studio singer. Ruth Szpunar is an Instruction and Reference Librarian at DePauw University and an Information Fluency Coordinator for PALNI. She has been at DePauw since 2005. In her spare time she can be found munching on chocolate or raiding the aisles at the Container Store. Megan West has been the Digital Communications Manager at PALNI since 2011. She specializes in graphic design, user experience, project management and has a strange addiction to colored pencils. Editor’s Note: This post is part of ACRL TechConnect’s series by our regular and guest authors about The Setup of our work. I carry my laptop to and from work with me and have an old MacBook Pro at home. One word that best describes how you work: has anyone said frenetic yet? Slack is the UX Dept. communication tool in which all our communication takes place, including instant messaging, etc. We create topic channels in which we add links and tools and thoughts, and get notified when people add items. We rarely use email for internal communication. Boomeranggmail-I write a lot of emails early in the morning so can schedule them to be sent at different times of the day without forgetting. Google Hangouts-We work closely with our Abu Dhabi and Shanghai campus libraries, so we do a lot of early morning and late night meetings using Google Hangouts (or GoToMeeting, below) to include everyone. GoToMeeting– to broadcast formal usability testing to observers in another room, so they can take notes and view the testing in real time and ask virtual follow up questions for the facilitator to ask participants. Crazy Egg-a heat mapping hot spotting A/B testing tool which, when coupled with analytics, really helps us get a picture of where users are going on our site. Silverback– Screen capturing usability testing software app. PostitPlus – We do a lot of affinity grouping exercises and interface sketches using post it notes, so this app is super cool and handy. Personas-To think through our user flows when thinking through a process, service, or interface. We then use these personas to create more granular user stories in Pivotal Tracker (above). I’m on the mezzanine of Bobst Library which is right across from Washington Square Park. I have a pretty big office with a window overlooking the walkway between Bobst and the Stern School of Business. I have a huge old subway map on one wall with an original heavy wood frame, and everyone likes looking at old subway lines, etc. I also have a map sheet of the mountain I’m named after. Otherwise, it’s all white board and I’ve added our personas to the wall as well so I can think through user stories by quickly scanning and selecting a relevant persona. I’m in an area where many of my colleagues mailboxes are, so people stop by a lot. I close my door when I need to concentrate, and on Fridays we try to work collaboratively in a basement conference room with a huge whiteboard. I have a heavy wooden L shaped desk which I am trying to replace with a standing desk. Every morning I go to Oren’s, a great coffee shop nearby, with the same colleague and friend, and we usually do “loops” around Washington Square Park to problem solve and give work advice. It’s a great way to start the day. Informal (but not happenstance) communication saves so much time in the long run and helps alleviate potential issues that can arise when people aren’t communicating. Though it takes a few minutes, I try to touch base with people regularly. I don’t think I do things better than other people, but I think my everyday strengths include: encouraging and mentoring, thinking up ideas and potential solutions, getting excited about other people’s ideas, trying to come to issues creatively, and dusting myself off. What do you listen to while at work? When we work collaboratively on creative things that don’t require earnest concentration I defer to one of the team to pick the playlist. Otherwise, I’d always pick Josh Ritter. Mostly an introvert who fakes being an extrovert at work but as other authors have said (Eric, Nicholas) it’s very dependent on the situation and the company. Early to bed, early to rise. I get up between 5-6 and go to bed between around 10. Bootstrap is the most popular front-end framework used for websites. An estimate by meanpath several months ago sat it firmly behind 1% of the web – for good reason: Bootstrap makes it relatively painless to puzzle together a pretty awesome plug-and-play, component-rich site. Its modularity is its key feature, developed so Twitter could rapidly spin-up internal microsites and dashboards. Oh, and it’s responsive. This is kind of a thing. There’s not a library conference today that doesn’t showcase at least one talk about responsive web design. There’s a book, countless webinars, courses, whole blogs dedicated to it (ahem), and more. The pressure for libraries to have responsive, usable websites can seem to come more from the likes of us than from the patronbase itself, but don’t let that discredit it. The trend is clear and it is only a matter of time before our libraries have their mobile moment. They’re not mobile-friendly at all. Let’s take a step back and consider whether using a framework is the right choice at all. A front-end framework like Bootstrap is a Lego set with all the pieces conveniently packed. It comes with a series of templates, a blown-out stylesheet, scripts tuned to the environment that let users essentially copy-and-paste fairly complex web-machinery into being. Carousels, tabs, responsive dropdown menus, all sorts of buttons, alerts for every occasion, gorgeous galleries, and very smart decisions made by a robust team of far-more capable developers than we. Except for the specific layout and the content, every Bootstrapped site is essentially a complete organism years in the making. This is also the reason that designers sometimes scoff, joking that these sites look the same. Decked-out frameworks are ideal for rapid prototyping with a limited timescale and budget because the design decisions have by and large already been made. They assume you plan to use the framework as-is, and they don’t make customization easy. In fact, Bootstrap’s guide points out that any customization is better suited to be cosmetic than a complete overhaul. The trade-off is that Bootstrap is otherwise complete. It is tried, true, usable, accessible out of the box, and only waiting for your content. It is still common to hear the selling point for a swanky new site is that it is “responsive down to mobile.” The phrase probably rings a bell. It describes a website that collapses its grid as the width of the browser shrinks until its layout is appropriate for whatever screen users are carrying around. This is kind of the point – and cool, as any of us with a browser-resizing obsession could tell you. Today, “responsive down to mobile” has a lot of baggage. Let me explain: it represents a telling and harrowing ideology that for these projects mobile is the afterthought when mobile optimization should be the most important part. Library design committees don’t actually say aloud or conceive of this stuff when researching options, but it should be implicit. When mobile is an afterthought, the committee presumes users are more likely to visit from a laptop or desktop than a phone (or refrigerator). This is not true. See, a website, responsive or not, originally laid out for a 1366×768 desktop monitor in the designer’s office, wistfully depends on visitors with that same browsing context. If it looks good in-office and loads fast, then looking good and loading fast must be the default. “Responsive down to mobile” is divorced from the reality that a similarly wide screen is not the common denominator. As such, responsive down to mobile sites have a superficial layout optimized for the developers, not the user. even so, the weight of the average website ( currently 1.6mb) is increasing. Last December, analysis of data from pagespeed quantiles during an HTTP Archive crawl tried to determine how fast the web was getting slower. The fastest sites are slowing at a greater rate than the big bloated sites, likely because the assets we send–like increasingly high resolution images to compensate for increasing pixel density in our devices–are getting bigger. So there was a big change to Bootstrap in August 2013 when it was restructured from a “responsive down to mobile” framework to “mobile-first.” It has also been given a simpler, flat design, which has 100% faster paint time – but I digress. “Mobile-first” is key. Emblazon this over the door of the library web committee. Strike “responsive down to mobile.” Suppress the record. Technically, “mobile-first” describes the structure of the stylesheet using CSS3 Media Queries, which determine when certain styles are rendered by the browser. The most basic styles are loaded first. As more space becomes available, designers can assume (sort of) that the user’s device has a little extra juice, that their connection may be better, so they start adding pizzazz. One might make the decision that, hey, most of the devices less than 48em (720px approximately with a base font size of 16px) are probably touch only, so let’s not load any hover effects until the screen is wider. In a literal sense, mobile-first is asset management. More than that, mobile-first is this philosophical undercurrent, an implicit zen of user-centric thinking that aligns with libraries’ missions to be accessible to all patrons. Designing mobile-first means designing to the lowest common denominator: functional and fast on a cracked Blackberry at peak time; functional and fast on a ten year old machine in the bayou, a browser with fourteen malware toolbars trudging through the mire of a dial-up connection; functional and fast [and beautiful?] on a 23″ iMac. Thinking about the mobile layout first makes design committees more selective of the content squeezed on to the front page, which makes committees more concerned with the quality of that content. This is the important statement that Bootstrap now makes. It expects the design committee to think mobile-first. It comes with all the components you could want, but they want you to trim the fat. That’s almost 250kb of website. This is like a browser eating a brick of Mackinac Island Fudge – and this high calorie bloat doesn’t include images. Consider that if the median load time for a 700kb page is 10-12 seconds on a phone, half that time with out-of-the-box Bootstrap is spent loading just the assets. To put this in context, I like to fall back on Ilya Girgorik’s example comparing load time to user reaction in his talk “Breaking the 1000ms Time to Glass Mobile Barrier.” If the site loads in just 0-100 milliseconds, this feels instant to the user. By 100-300ms, the site already begins to feel sluggish. At 300-1000ms, uh – is the machine working? After 1 second there is a mental context switch, which means that the user is impatient, distracted, or consciously aware of the load-time. After 10 seconds, the user gives up. By choosing not to pair down, your Bootstrapped Library starts off on the wrong foot. Even though Bootstrap provides modals, tabs, carousels, autocomplete, and other modules, this doesn’t mean a website needs to use them. Bootstrap lets you tailor which jQuery plugins are included in the final script. The hardest part of any redesign is to let quality content determine the tools, not the ability to tabularize or scrollspy be an excuse to implement them. Oh, don’t Google those. I’ll touch on tabs and scrollspy in a few minutes. I am going to be super presumptuous now and walk through the total Bootstrap package, then make recommendations for lightening the load. With that said, CSS Transitions have pretty good browser support and they probably aren’t crucial to the functionality of the library website on IE9. “Modals” are popup windows. There are plenty of neat things you can do with them. Additionally, modals are a pain to design consistently for every browser. Let Bootstrap do that heavy lifting for you. It’s hard to conclude a library website design committee without a lot of links in your menu bar. Dropdown menus are kind of tricky to code, and Bootstrap does a really nice job keeping it a consistent and responsive experience. If you have a fixed sidebar or menu that follows the user as they read, scrollspy.js can highlight the section of that menu you are currently viewing. This is useful if your site has a lot of long-form articles, or if it is a one-page app that scrolls forever. I’m not sure this describes many library websites, but even if it does, you probably want more functionality than Scrollspy offers. I recommend jQuery-Waypoints – but only if you are going to do something really cool with it. Tabs are a good way to break-up a lot of content without actually putting it on another page. 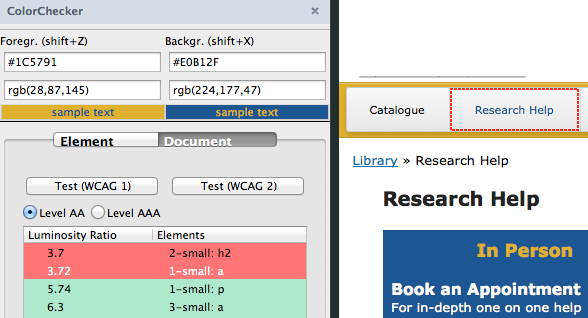 A lot of libraries use some kind of tab widget to handle the different search options. If you are writing guides or tutorials, tabs could be a nice way to display the text. Tooltips are often descriptive popup bubbles of a section, option, or icon requiring more explanation. Tooltips.js helps handle the predictable positioning of the tooltip across browsers. With that said, I don’t think tooltips are that engaging; they’re sometimes appropriate, but you definitely use to see more of them in the past. Your library’s time is better spent de-jargoning any content that would warrant a tooltip. Need a tooltip? Why not just make whatever needs the tooltip more obvious O_o? Alerts.js lets your users dismiss alerts that you might put in the header of your website. It’s always a good idea to give users some kind of control over these things. Better they read and dismiss than get frustrated from the clutter. The collapse plugin allows for accordion-style sections for content similarly distributed as you might use with tabs. 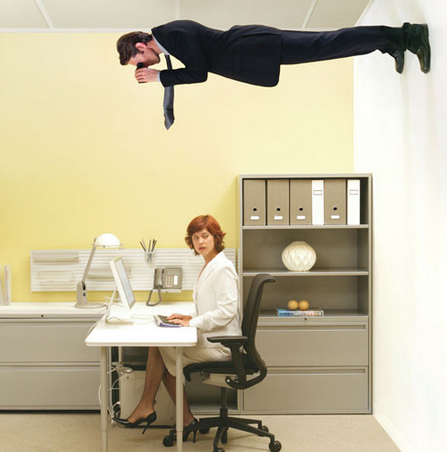 The ease-in-ease-out animation triggers motion-sickness and other aaarrghs among users with vestibular disorders. You could just use tabs. Button.js gives a little extra jolt to Bootstrap’s buttons, allowing them to communicate an action or state. By that, imagine you fill out a reference form and you click “submit.” Button.js will put a little loader icon in the button itself and change the text to “sending ….” This way, users are told that the process is running, and maybe they won’t feel compelled to click and click and click until the page refreshes. This is a good thing. Carousels are the most popular design element on the web. It lets a website slideshow content like upcoming events or new material. Carousels exist because design committees must be appeased. There are all sorts of reasons why you probably shouldn’t put a carousel on your website: they are largely inaccessible, have low engagement, are slooooow, and kind of imply that libraries hate their patrons. I’m not exactly sure what this does. I think it’s a fixed-menu thing. You probably don’t need this. You can use CSS. There is more to say. When bouncing this topic around twitter awhile ago, Jeremy Prevost pointed out that Bootstrap’s minified assets can be GZipped down to about 20kb total. This is the right way to serve assets from any framework. It requires an Apache config or .htaccess rule. Here is the .htaccess file used in HTML5 Boilerplate. You’ll find it well commented and modular: go ahead and just copy and paste the parts you need. You can eke out even more performance by “lazy loading” scripts at a given time, but these are a little out of the scope of this post. Here’s the thing: when we talk about having good library websites we’re mostly talking about the look. This is the wrong discussion. Web designs driven by anything but the content they already have make grasping assumptions about how slick it would look to have this killer carousel, these accordions, nifty tooltips, and of course a squishy responsive design. Subsequently, these responsive sites miss the point: if anything, they’re mobile unfriendly. Much of the time, a responsive library website is used as a marker that such-and-such site is credible and not irrelevant, but as such the website reflects a lack of purpose (e.g., “this website needs to increase library-card registration). A superficial understanding of responsive webdesign and easy-to-grab frameworks entail that the patron is the least priority. Michael Schofield is a front-end librarian in south Florida, where it is hot and rainy – always. He tries to do neat things there. You can hear him talk design and user experience for libraries on LibUX. Almost all librarians have a love-hate relationship with their library catalogs (OPAC), which are used by library patrons. Interestingly enough, I hear a lot more complaints about the library catalog from librarians than patrons. Sometimes it is about the catalog missing certain information that should be there for patrons. 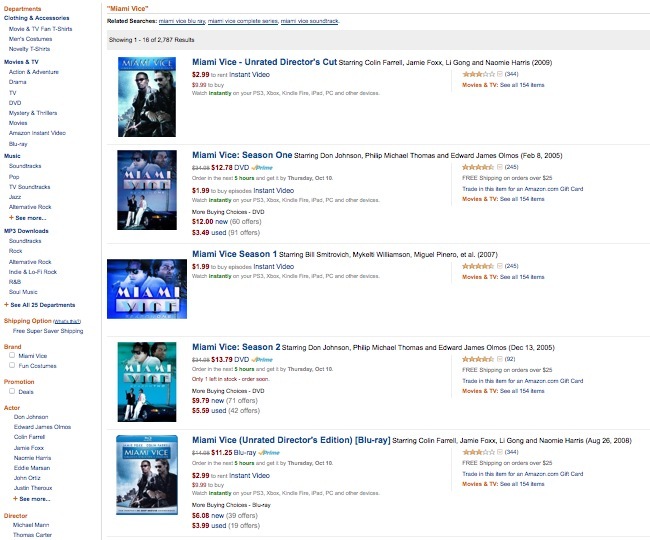 But many other times, it’s about how crowded the search results display looks. We actually all want a clean-looking, easy-to-navigate, and efficient-to-use library catalog. But of course, it is much easier to complain than to come up with an viable alternative. Aaron Schmidt has recently put forth an alternative design for a library item record. In his blog post, he suggests a library catalog shifts its focus from the bibliographic information (or metadata if not a book) of a library item to a patron’s tasks performed in relation to the library item so that the catalog functions more as “a tool that prioritizes helping people accomplish their tasks, whereby bibliographic data exists quietly in the background and is exposed only when useful.” This is a great point. Throwing all the information at once to a user only overwhelms her/him. Schmidt’s sketch provides a good starting point to rethink how to design the library catalog’s search results display. The example above is, of course, too simple to apply to the library catalog of an academic library straight away. 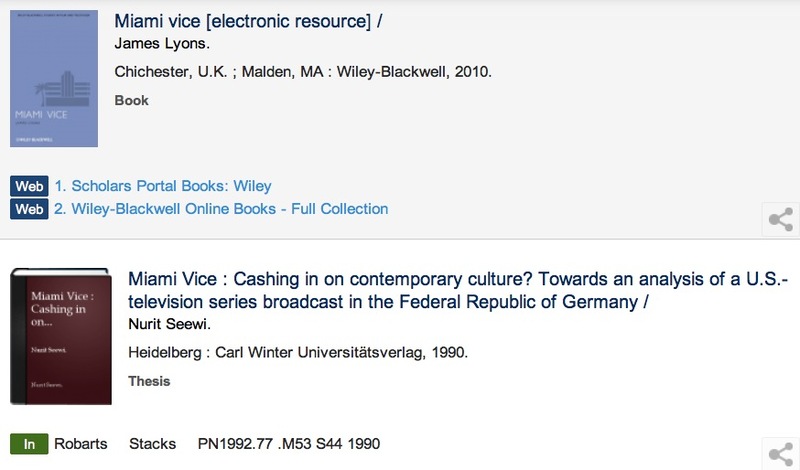 For an usual academic library patron to determine whether s/he wants to either check out or reserve the item, s/he is likely to need a little more information than the book title, the author, and the book image. For example, students who look for textbooks, the edition information as well as the year of publication are important. But I take it that Schmidt’s point was to encourage more librarians to think about alternative designs for the library catalog rather than simply compare what is available and pick what seems to be the best among those. 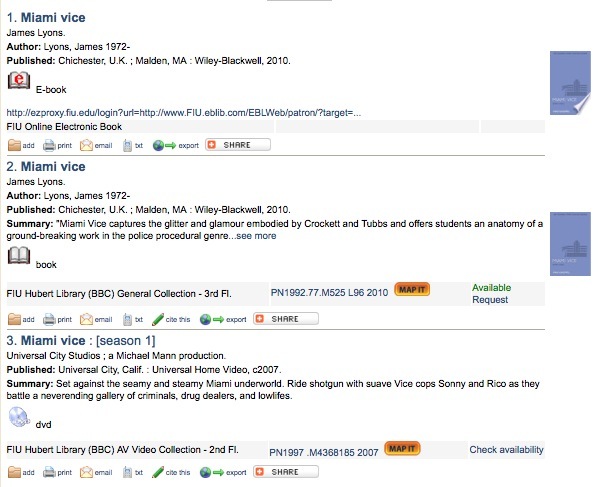 Granted that there may be limitations in how much we can customize the search results display of a library catalog. But that is not a reason to stop thinking about what the optimal display design would be for the library catalog search results. Sketching alternatives can be in itself a good exercise in evaluating the usability of an information system even if not all of your design can be implemented. Furthermore, more and more libraries are implementing a discovery layer over their library catalogs, which provides much more room to customize the display of search results than the traditional library catalog. Open source discovery systems such as Blacklight or VuFind provides great flexibility in customizing the search results display. Even proprietary discovery products such as Primo, EDS, Summon offer a level of customization by the libraries. Below, I will discuss some principles to follow in sketching alternative designs for search results in a library catalog, present some of my own sketches, and show other examples implemented by other libraries or websites. Reveal just enough information that is essential to determine the next action. These are not new principles. They are widely discussed and followed by many web designers including librarians who participate in their libraries’ website re-design. But we rarely apply these to the library catalog because we think that the catalog is somehow beyond our control. This is not necessarily the case, however. Many libraries implement discovery layers to give a completely different and improved look from that of their ILS-es’ default display. Here is the basic book record summary view. What I tried to do here is giving just enough information for the next action but not more than that: title, author, type, year, publisher, number of library copies and holds. The next action for a patron is to check the item out. On the other hand, undecided patrons will click the title to see the detailed item record or have the detailed item record to be texted, printed, e-mailed, or to be used in other ways. This is a record of a book that has an available copy to check out. Only when a patron decides to check out the item, the next set of information relevant to that action – the item location and the call number – is shown. If no copy is available for check-out, the best way to display the item is to signal that check-out is not possible and to highlight an alternative action. You can either do this by graying out the check-out button or by hiding the button itself. Many assume that adding more information would automatically increase the usability of a website. While there are cases in which this could be true, often a better option is to reveal information only when it is relevant. I decided to gray out the check-out button when there is no available copy and display the reserve button, so that patrons can place a hold. Information about how many copies the library has and how many holds are placed (“1 hold / 1 copy”) would help a patron to decide if they want to reserve the book or not. I also sketched two other records: one for an e-Book without the cover image and the other with the cover image. Since the appropriate action in this case is reading online, a different button is shown. You may place the ‘Requires Login’ text or simply omit it because most patrons will understand that they will have to log in to read a library e-book and also the read-online button will itself prompt log in once clicked anyway. 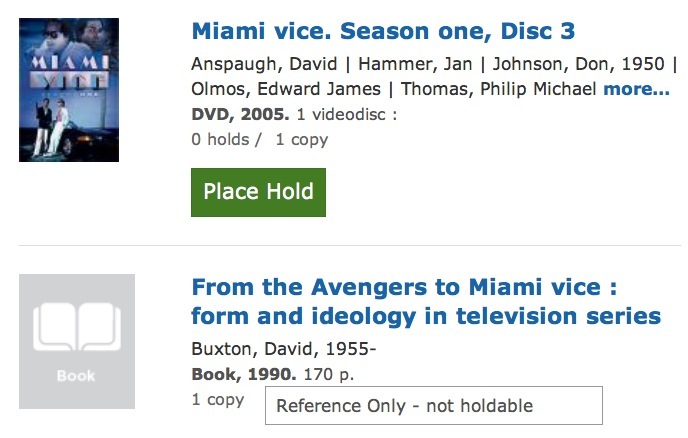 When there are multiple options for one electronic resource, those options can be presented in a similar way in which multiple copies of a physical book are shown. For a downloadable resource, changing the name of the button to ‘download’ is much more informative. Needless to say, I did not come up with my sketches from scratch. 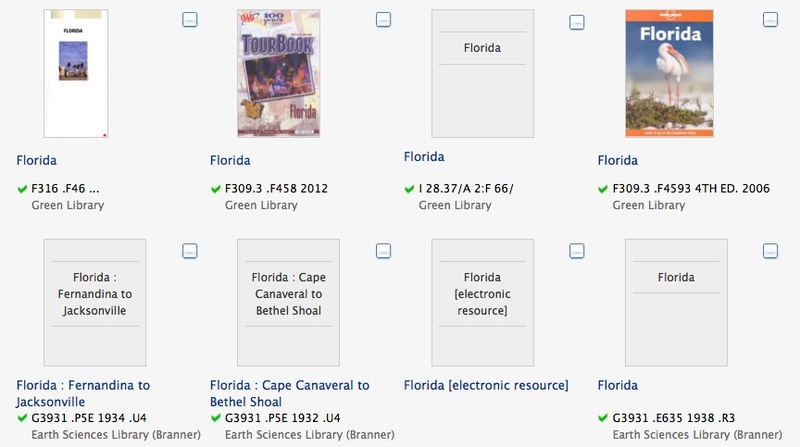 Here are the library catalogs whose item record summary view inspired me. User Experience Designer Ryan Feely, who worked on Toronto Public Library’s catalog search interface, pointed out the difference between a link and an action in his 2009 presentation “Toronto Public Library Website User Experience Results and Recommendations.” Actions need to be highlighted as a button or in some similar design to stand out to users (slide 65). And ideally, only the actions available for a given item should be displayed. Another good point which Feely makes (slide 24) is that an icon is often the center of attention and so a different icon should be used to signify different type of materials such as a DVD or an e-Journal. Below are the icons that Toronto Public Library uses for various types of library materials that do not have unique item images. These are much more informative than the common “No image available” icon. 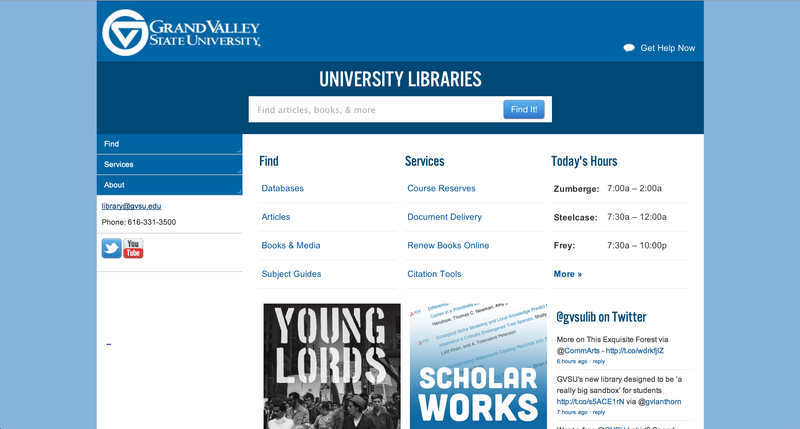 University of Toronto Libraries has recently redesigned their library catalog to be completely responsive. Their item record summary view in the catalog is brief and clear. Each record in the summary view also uses a red and a green icon that helps patrons to determine the availability of an item quickly. The icons for citing, printing, e-mailing, or texting the item record that often show up in the catalog are hidden in the options icon at the bottom right corner. When the mouse hovers over, a variety of choices appear. 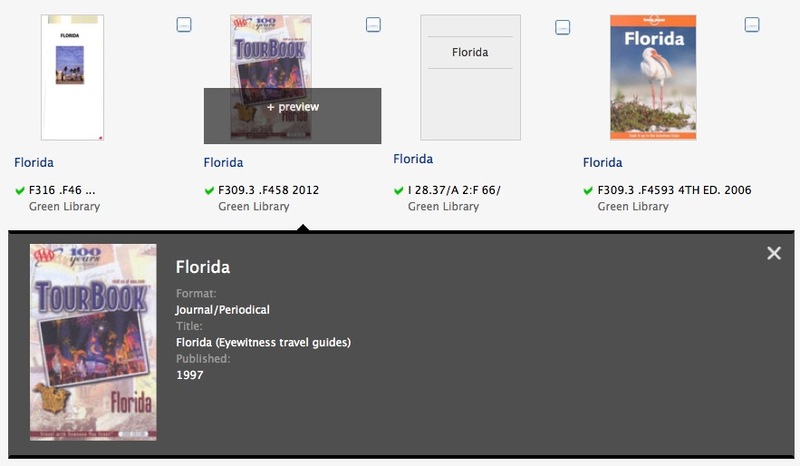 Richland Library’s catalog displays library items in a grid as a default, which makes the catalog more closely resemble an online bookstore or shopping website. Patrons can also change the view to have more details shown with or without the item image. The item record summary view in the default grid view is brief and to the point. The main type of patron action, such as Hold or Download, is clearly differentiated from other links as an orange button. Standford University Library offers a grid view (although not as the default like Richland Library). The grid view is very succinct with the item title, call number, availability information in the form of a green checkmark, and the item location. What is interesting about Stanford University Library catalog (using Blacklight) is that when a patron hovers its mouse over an item in the grid view, the item image displays the preview link. And when clicked, a more detailed information is shown as an overlay. Brigham Young University completely customized the user interface of the Primo product from ExLibris. 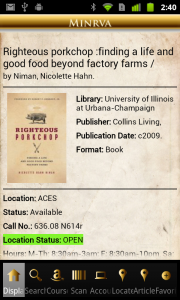 And University of Michigan Library customized the search result display of the Summon product from SerialsSolutions. Here are some other item record summary views that are also fairly straightforward and uncluttered but can be improved further. 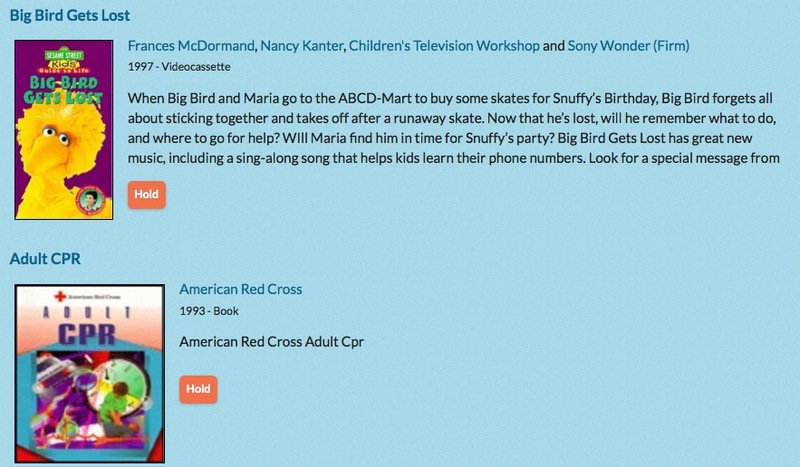 Sacramento Public Library uses the open source discovery system, VuFind, with little customization. The biggest challenge in designing the item record summary view is to strike the balance between too little information and too much information about the item. Too little information will require patrons to review the detailed item record just to identify if the item is the one they are looking for or not. Since librarians know many features of the library catalog, they tend to err on the side of throwing all available features into the item record summary view. But too much information not only overwhelms patrons and but also makes it hard for them to locate the most relevant information at that stage and to identify the next available action. Any information irrelevant to a given task is no more than noise to a patron. Large online shopping websites, Amazon, Barnes & Noble, and eBay all make a good use of these strategies. There are no labels such as ‘price,’ ‘shipping,’ ‘review,’ etc. Amazon highlights the price and the user reviews most since those are the two most deciding factors for consumers in their browsing stage. Amazon only offers enough information for a shopper to determine if s/he is further interested in purchasing the item. So there is not even the Buy button in the summary view. 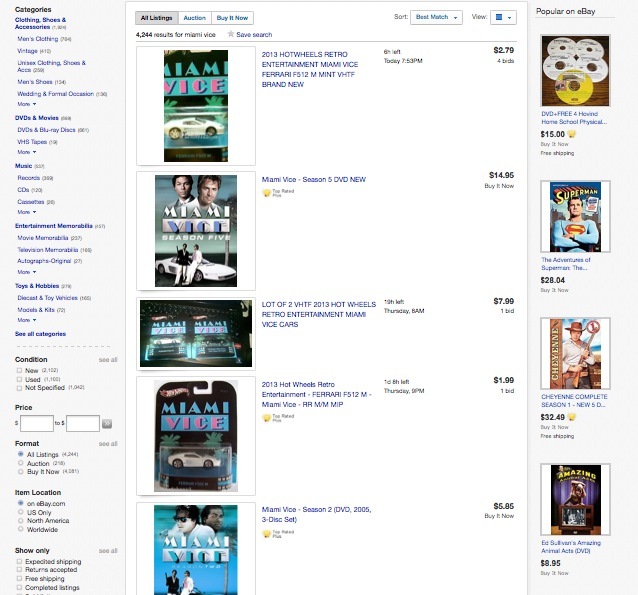 Once a shopper clicks the item title link and views the detailed item record, then the buying options and the ‘Add to Cart’ button are displayed prominently. 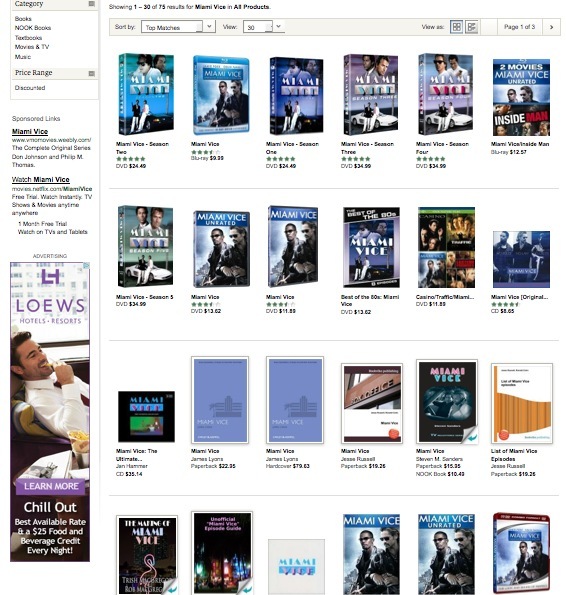 Barnes & Noble’s default display for search results is the grid view, and the item record summary view offers only the most essential information – the item title, material type, price, and the user ratings. eBay’s item record summary view also offers only the most essential information, the highest bid and the time left, while people are browsing the site deciding whether to check out the item in further detail or not. An item record summary view, which we have discussed so far, is surely the main part of the search results page. But it is only a small part of the search results display and even a smaller part of the library catalog. Optimizing the search results page, for example, entails not just re-designing the item record summary view but choosing and designing many other elements of the page such as organizing the filtering options on the left and deciding on the default and optional views. Determining the content and the display of the detailed item record is another big part of creating a user-friendly library catalog. If you are interested in this topic, Tony Russell-Rose and Tyler Tate’s book Designing the Search Experience (2013) provides an excellent overview. Librarians are professionals trained in many uses of a searchable database, a known item search, exploring and browsing, a search with incomplete details, compiling a set of search results, locating a certain type of items only by location, type, subject, etc. But since our work is also on the operation side of a library, we often make the mistake of regarding the library catalog as one huge inventory system that should hold and display all the acquisition, cataloging, and holdings information data of the library collection. But library patrons are rarely interested in seeing such data. They are interested in identifying relevant library items and using them. All the other information is simply a guide to achieving this ultimate goal, and the library catalog is another tool in their many toolboxes. Online shopping sites optimize their catalog to make purchase as efficient and simple as possible. Both libraries and online shopping sites share the common interests of guiding the users to one ultimate task – identifying an appropriate item for the final borrowing or access/purchase. For creating user-oriented library catalog sketches, it is helpful to check out how non-library websites are displaying their search results as well. Once you start looking other examples, you will realize that there are very many ways to display search results and you will soon want to sketch your own alternative design for the search results display in the library catalog and the discovery system. What do you think would be the level of optimum detail for library items in the library catalog or the discovery interface? Tony Russell-Rose, “Designing Search Displaying Results,” UX Magazine, 2013. Tony Russell-Rose and Tyler Tate, Designing the Search Experience, Morgan Kaufmann, 2013. Last June I had a great experience team-teaching a week-long seminar on designing mobile apps at the Digital Humanities Summer Institute (DHSI). Along with my colleagues from WSU Vancouver’s Creative Media and Digital Culture (CMDC) program, I’ll be returning this June to the beautiful University of Victoria in British Columbia to teach the course again1. As part of the course, I created a visual overview of the process we use for app making. I hope you’ll find it a useful perspective on the work involved in crafting mobile apps and an aid to the process of creating your own. I’m fond of the tube-map infographic style, also know as the topological map2, because of its ability to highlight relationships between systems and especially because of how it distinguishes between linear (do once) and recursive (do over and over) processes. The linear nature of text in a book or images in slide-deck presentations can artificially impose a linearity that does not mirror the creative process we want to impart. In this example, the design and prototyping loops on the tube-map help communicate that a prototype model is an aid to modeling the design process and not a separate step completed only when the design has been finalized. These maps are also fun and help spur the creative process. There are other tools for process mapping such as using flowcharts or mind-maps, but in this case I found the topological map has a couple of advantages. First and foremost, I associate the other two with our strategic planning process, so the tube map immediately seems more open, fun, and creative. This is, of course, rooted in my own experience and your experiences will vary but if you are looking for a new perspective on process mapping or a new way to display interconnected systems that is vibrant, fun, and shakes things up a bit the tube map may be just the thing. I created the map using the open source vector-graphics program Inkscape3 which can be compared to Adobe Illustrator and Corel Draw. Inkscape is free (both gratis and libre) and is powerful, but there is a bit of a learning curve. Being unfamiliar with vector graphics or the software tools to create them, I worked with an excellent tutorial provided by Wikipedia on creating vector graphic topological maps4. It took me a few days of struggling and slowly becoming familiar with the toolset before I felt comfortable creating with Inkscape. I count this as time well spent, as many graphics used in mobile app and icon sets required by app stores can be made with vector graphic editors. The Inkscape skills I picked up while making the map have come in very handy on multiple occasions since then. Our process through the map begins with a requirements analysis or needs assessment. We ask: what does the client want the app to do? What do we know about our end users? How do the affordances of the device affect this? Performing case studies helps us learn about our users before we start designing to meet their needs. In the design stage we want people to make intentional choices about the conceptual and aesthetic aspects of their app design. Prototype models like wireframe mock-ups, storyboards, or Keynotopia5 prototypes help us visualize these choices, eventually resulting in a working prototype of our app. Stakeholders can test and request modifications to the prototype, avoiding potentially expensive and labor intensive code revisions later in the process. Once the prototype has been coded into a hybrid app, we have another opportunity for evaluation and usability testing. We teach a pervasive approach that includes evaluation and testing all throughout the process, but this stage is very important as it is a last chance to make changes before sending the code to an app marketplace. After the app has been submitted, opportunities to make updates, fix bugs, and add features can be limited, sometimes significantly, by the app store’s administrative processes. 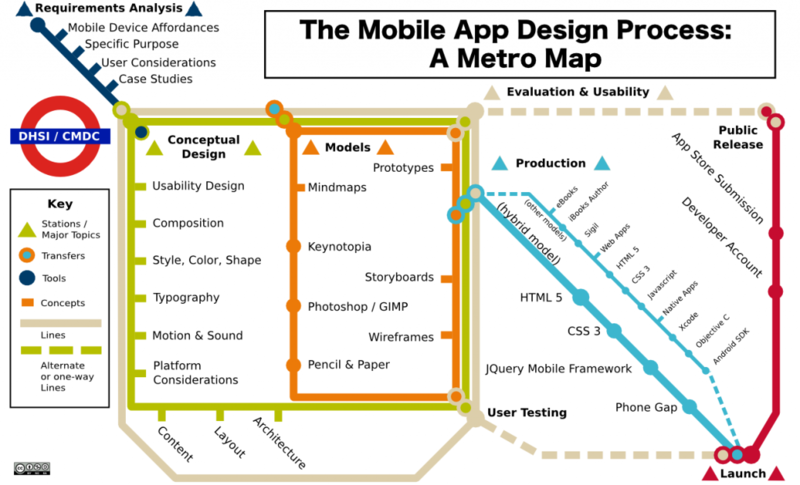 After you have spent some time following the lines of the tube map and reading this very brief description, I hope you can see this infographic as an aid to designing mobile web apps. I find it particularly helpful for identifying the source of a particular problem I’m having and also suggesting tools and techniques that can help resolve it. As a personal example, I am often tempted to start writing code before I’ve completely made up my mind what I want the code to do, which leads to frustration. I use the map to remind me to look at my wireframe and use that to guide the structure of my code. I hope you all find it useful as well. In Part 1, I covered what web accessibility is, its importance, and the Web Content Accessibility Guidelines (WCAG). This post focuses on how to implement WCAG into the structure and layout of the website (including templates/themes, plugins, etc.). While I will be referring to WCAG, I have based this post on what I have found in terms of general best practices, so hopefully this post is applicable to any site. First off, I’m going to assume that at the very least your website uses a template even if it doesn’t use a content management system (CMS). Whether your site is developed in-house or not, the points below should be true, otherwise you’re making your website inaccessible for everyone (not just those with accessibility needs). To provide multiple ways to content, I’m partial to providing links to related pages (local nav) and a search bar, but there are other options. If you want your secondary content to show up before your primary content, you can just use CSS to move the divs around visually. Your site also needs to be accessible by keyboard, and to help screenreader users (and those that use text based browsers), you can allow bypass blocks by inserting an anchor link that would allow users to skip blocks of content that are repeated on the various pages of a website. A responsive site allows all your users to access and view your site on any size device, screen resolution, and browser window size (within reason). 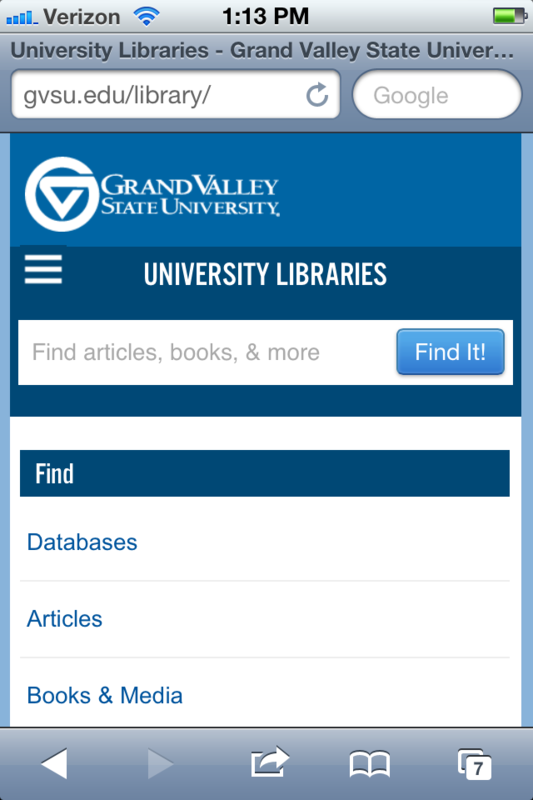 For example, take a look at Grand Valley State Libraries’ website in the desktop and mobile views below. If you’re unfamiliar with responsive web design, you may want to take a look at Lisa Kurt’s Responsive Web Design and Libraries post to become more familiar with the topic. The basic technique to make a site responsive is by using media queries shift the look of the content depending on screen size. Making a site responsive already provides greater access to all your users, but you can take this farther with a simple difference to make your site even more accessible. If you use ’em’ (instead of pixels) for your media queries (see Matthew Reidma’s Responsive Web Design for Libraries) in your responsive template, you should be able to resize your page up to 200% without any problems (1.4.4). As part of your responsive design, also consider that touch screens don’t have the highest precision, so links and any other interactive pieces should not be too small. In general, this also helps users who have difficulty with fine motor skills to navigate your site. You may optionally include more metadata, not only for the benefit of screen readers, but also for indexing purposes. A number of guidelines deal with presentation aspects. At the very basic level, presentation and layout should be separate from content. So layout control (such as sizes, floats, padding, etc. ), colours, fonts, and practically anything you would put in ‘style’ should be done in CSS, separating it from the HTML (1.3.1). Screen readers (and other tools) can override CSS rules or turn CSS off completely, allowing the user to customize the font, colour, link colour, etc. It will highlight errors in red, and you can click on any line which will highlight the related element. The only problem is when you have multiple elements layered on top of each other. As you can see in the example, it’s checking the colour of the text ‘Research Help’ against the yellow you see bordering the menu (global navigation), rather than the element right behind the text. So, you do have to vet the results, but it’s a great little tool to help you quickly check the contrast of your text colours, and for images, you can enter numbers manually yourself to easily check the ratio. For more tools, like the colour contrast checker, check out the W3C Web Accessibility Tools list. My picks are WAVE (gives you different views, such as text-only) and Fangs (screen reader emulator). There are a lot more techniques that I haven’t covered in the WCAG Quick Reference, but be cautioned that some of these techniques are already obsolete. Follow the guidelines as those are the requirements; the techniques are ways that do fulfill the guidelines, but not the required way to do so. As this post focuses on HTML/CSS, it does not cover scripts, Flash, or PDF. The WCAG Quick Reference covers these and more. If you’re using plugins, then at least make it a feature request, and consider contributing to the plugin to make it accessible. Libraries in particular use a multitude of tools and services. No one can expect your organization to make all your tools and services web accessible, especially when you likely don’t have full control over all of them. Nevertheless, do what you can, and request/advocate for web accessibility to companies that you have dealings with when it’s not controlled in-house. Even asking whether web accessibility guidelines have been considered or met can start the conversation going, as the developers may have simply not thought about accessibility. There are also some workarounds, such as providing an overlay (which I will cover in the next post in regards to video), but most workarounds I have seen take away functionality for some users, while making it more accessible for others. Always best to have accessibility built-in to a product or site. While there are a few techniques that are specially to make sites accessible for people with disabilities, good, solid design principles will go a long way in making an accessible site for all your users. You also don’t need to redesign your whole site. Consider using the agile development idea and implementing one technique at a time to improve your site over time. In this post, I have focused on the structure and layout of the website, i.e. the elements that you would typically have in themes or templates. I have purposely left out guidelines that deal with the content of a website as many organizations rely on various staff members to populate the site with content (usually through a CMS), including content that might be done either by IT or non-IT staff, such as forms and audio/visual content. However, all the content related guidelines also apply to any template or generated content (links, images, forms e.g. search bar), which is what I will cover in the third and final post. About our Guest Author: Cynthia Ng is currently the Web Services Librarian at Ryerson University Library and Archives. While she is especially interested in web development and services, her focus is on integrating technology into the library in a holistic manner to best serve its users. She is a recent MLIS graduate from the University of British Columbia, and also holds a BEd from UBC. She can be found blogging at Learning (Lib)Tech and on Twitter as @TheRealArty. The University of Illinois’ team of IT diversity interns are working on departmental-specific mobile app modules and user studies of those app modules this Fall semester. The Illinois library is a decentralized system of nearly thirty departmental libraries serving diverse needs of staff, researchers, scientists, graduate students, and undergraduate students. Given such a diverse population, we wondered if it was possible to turn our prototyping pipeline to connect with other unit specific needs outside of our own space, the Undergraduate Library. Specifically, this fall we wanted to understand how departmental collections and other library locations would use our already developed RESTful web services –which serves as the core component of the prototyping pipeline– for departmental and subject based mobile application modules. This blog post describes the methods we used to quickly gather feedback on new and exciting features for department collections.The mobile application modules we studied include enhanced wayfinding support of multi-story buildings and collections (originally designed for an undergrad space of one level of collections), a reserves module for all libraries, and hours integration into book information data elements. 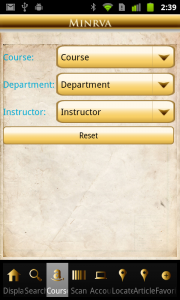 This module includes a navigation rose in the upper left corner of the mobile interface. Included is functionality for line segments that draw your current location to the location of your desired book in the stacks. 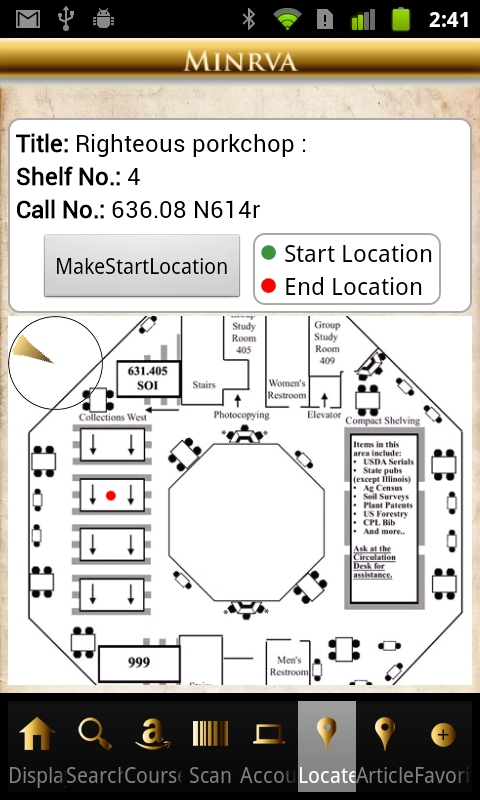 The user can get their current location in the book stacks by using the barcode scanner module to scan the book nearest them, which then sets their current location. 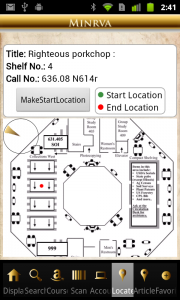 After setting their current location, any additional book that is then searched for in the library will generate a line segment path to the location of the searched for book. Turn by turn directional support based on user location is a new enhancement, though we’ve been getting requests a few times in our previous user studies, from 2010-2011 use studies on maps and library wayfinding using mobile devices. 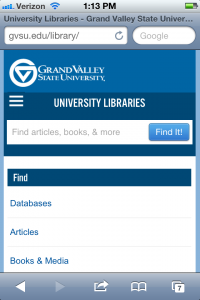 This reserve program offers the student access to library reserves from an Android device. 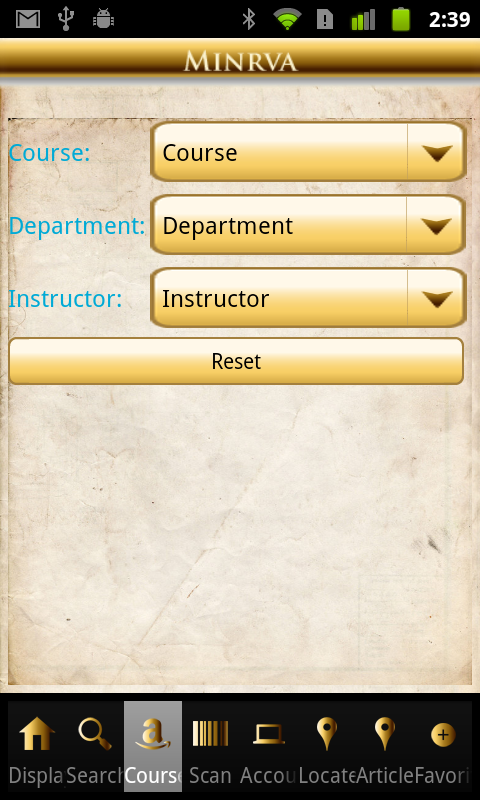 The multiple drop downs allow the student to select her course reserves by either course, department, or major. If the item is in a library that is closed, this item may not useful to a student. Most OPACs will let you know if the book is available. This is not always so straightforward in OPACs that inventory multiple locations. Some of the departmental collections actually have business hours of 9-5, or other limited hours during the weekend, yet the OPAC will show an item as Available so long as the book is not checked out. We tried to address the problem in our display module by adding a location status to the library — this checks against an hours database to let the user know if the library is actually open for the student to check out an available book. With a number of feature enhancements to our core set of mobile app modules, we wanted to gather empirical data that could inform production services. The fastest way to get user input into modules that may be in the early design phase is to approach users who are currently in the building. 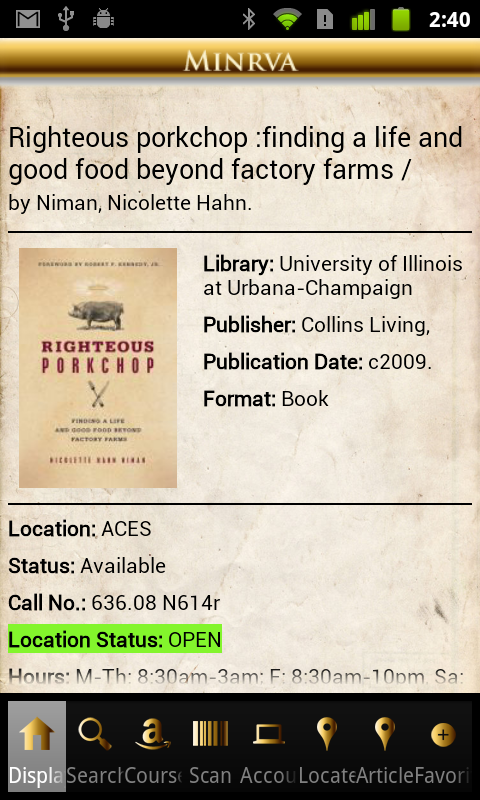 In the case of these modules, we were experimenting with the idea of location services in department collections, and the wayfinding support was specific to the ACES library and so we made this our test location. Once here we approached users with a test set of questions around the modules. We asked what parts of the app are useful for helping the students integrate library resources into their work. We also asked and observed what doesn’t help, and additionally what features would be worthwhile to further develop. Please describe any previous experience finding items in the Funk ACES Library? What software modules help students integrate library content into their course work? How easy to use is the application? Does the student need time to learn how to use the software? How do students react when the application does not work as they expect? Do students make use of the location-based features? After collecting initial use data the team is reshaping a few of the modules to make them easier to use while at the same time brainstorming ideas for making some of the features more evident. One of the key findings of this last round of user studies was that although we implemented a number of requested features, students could not always locate, and then use or in some cases understand the features and how they would help. So we need to think about making the help features more helpful, and more engaging, overall. We theorize that another reason they couldn’t always find the help tools we designed into the ACES modules was the fact that the modular offerings of our experiment have become a bit cluttered. If you take a look at any of the above screenshots you will notice their were eight included modules in the bottom of the mobile interface for this study. We did put many options in front of the study participants, so the next round of user studies will be more focused on areas we think are worthwhile to develop: particularly the engaging elements of wayfinding, but also the reserves module was called out as the one part that students considered would be most helpful for integrating library resources into their work. Finally, as we poured over a few of the software choices we made to construct the Android layers, we realized they were not quite modular enough, and so this caused errors in overall functionality of the app during the study. To correct this we are thinking about definitions for the core aspects of modular design. A final step for our work this semester is to showcase all of our software prototypes to the library staff at the University of Illinois. To that end we are having an open house during finals week, where we are inviting all staff members into our prototyping space and asking also for their feedback on the software developed, and ask staff to try out some of the newest ideas in mobile technology, including our in-development augmented reality shelf browser, which is being coded with funds from a Sparks! IMLS grant. A user study for mobile augmented reality applications is planned this Spring 2013. Another information technology problem we will work on in the Spring 2013 semester is how to incorporate our RESTful feeds into the library discovery layers. The Music and Performing Arts library location is likely our next collaboration for stacks based wayfinding support inside of the OPAC. 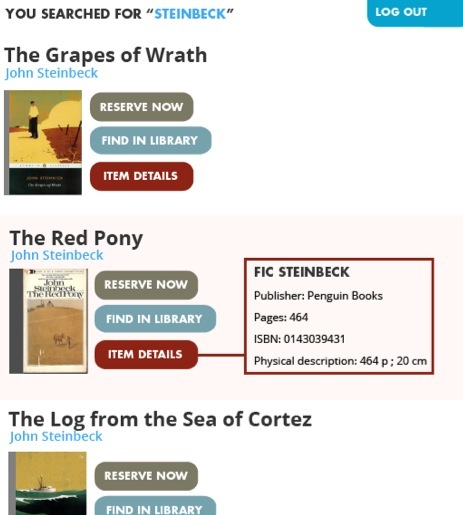 We would like to integrate our wayfinding feed into the OPAC to help students get from the book information to the stacks location, using the RESTful web-services we’ve designed for system efficiency from the onset. The next step for our fledgling prototyping initiative is system integration, which involves taking this prototype work and injecting its most useful and used components into production environments like our VuFind search and our Primo discovery layer.